Featured in the second position on the Home Page. 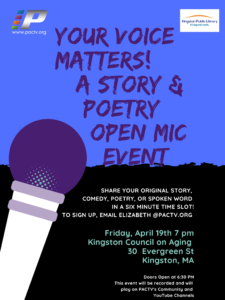 PACTV, the Kingston Public Library, and the Kingston Council on Aging are proud to announce Your Voice Matters! A Story and Poetry Open Mic Event! You have a story you’ve told many times – why not share it? We are excited to hear your original poetry, spoken word, or story! Share your original story, comedy, poetry, or spoken word in a six minute time slot! To sign up to perform, email Elizabeth at Elizabeth@PACTV.org. This event will take place at the Kingston Council on Aging located at 30 Evergreen Street. Doors will open at 6:30pm. This event will be recorded and played on PACTV’s Community and YouTube channels.